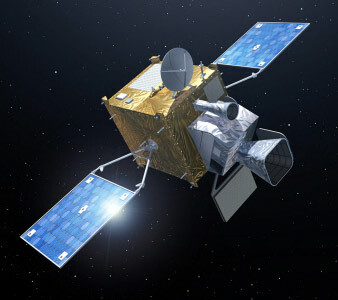 MTG (Meteosat Third Generation) is the follow-up system to Meteosat MSG series of geostationary satellites. The satellite system will consist of a twin configuration of 3-axis-stabilised satellites: the Imaging mission satellite (MTG-I) and the Sounding mission satellite (MTG-S). The payload proposed for MTG-S would have an Infrared Sounder (IRS) and Ultra-violet Visible Near-infrared (UVN) Sounder, the latter provided by ESA as Sentinel 4 instruments of Kopernikus, formerly the Global Monitoring for Environment and Security (GMES) programme. The UVN mission on MTG is one component of the joint Kopernikus Sentinel 4 and 5 concept for climate protocol monitoring and air quality applications expected to deliver data products on ozone, nitrogen dioxide, sodium dioxide, formaldehyde, aerosol optical depth, and aerosol scattering height. The satellites will be renamed to Meteosat when they become operational. MTG-S 1 (Meteosat 13, Sentinel 4A) - 2021 Ko ELA-3 Ariane-5ECA with ?